Episode 188, July 26, 2016. This week Brent Muscat from Faster Pussycat Plays Our Version of F**k, Marry, Kill which we call Krank, Kill, Redo. Brent also shares stories from touring with KISS on the Hot in the Shade and Revenge tours, as well as touring with Ace Frehley on his first solo tour. What happened when Faster Pussycat pulled a end of tour prank on KISS? What happened when Trixter pulled a end of tour prank on Faster Pussycat? Brent also shares stories about the Sunset Strip and bands ... Más informaciones like Guns N Roses and LA Guns. 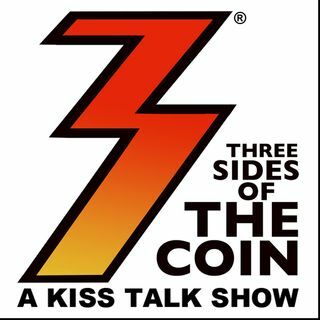 Since launching in 2013 Three Sides of the Coin has been viewed or listened to over 2,000,000 times. Three Sides of the Coin has been joined by special guests including former KISS lead guitarist Bruce Kulick, the Black Veil Brides' Andy Biersack, Frank Munoz associate producer for Ace Frehley's Anomaly album, award winning songwriter Adam Mitchell, Ed Kanon (Peter Criss' drum tech), and Kevin Valentine (drummer on KISS' Psycho Circus album). Three Sides of the Coin was picked (October 2013) as a 'What's Hot' podcast by Apple's iTunes. How about a shout out fellas?